Jundishapur Journal of Microbiology - Heterologous Expression of Hepatitis C Virus Core Protein in Oil Seeds of <i>Brassica napus</i> L.
Heterologous Expression of Hepatitis C Virus Core Protein in Oil Seeds of Brassica napus L.
To Cite: Mohammadzadeh S, Roohvand F, Ajdary S, Ehsani P, Hatef Salmanian A. Heterologous Expression of Hepatitis C Virus Core Protein in Oil Seeds of Brassica napus L., Jundishapur J Microbiol. 2015 ; 8(11):e25462. doi: 10.5812/jjm.25462. Background: Hepatitis c virus (HCV), prevalent among 3% of the world population, is a major worldwide public health concern and an effective vaccination could help to overcome this problem. Plant seeds as low-cost vaccine expression platforms are highly desirable to produce antigens. Objectives: The present study was aimed at investigating the possible expression of recombinant HCV core protein, as a leading HCV vaccine candidate, in canola (Brassica napus) plant seeds in order to be used as an effective immunogen for vaccine researches. Materials and Methods: A codon-optimized gene harboring the Kozak sequence, 6 × His-tag, HCVcp (1 - 122 residues) and KDEL (Lys-Asp-Glu-Leu) peptide in tandem was designed and expressed under the control of the seed specific promoter, fatty acid elongase 1 (FAE1), to accumulate the recombinant protein in canola (B. napus L.) seeds. Transgenic lines were screened and the presence of the transgene was confirmed in the T0 plants by polymerase chain reaction (PCR). The quantity and quality of the HCV core protein (HCVcp) in transgenic seeds were evaluated by enzyme-linked immunosorbent assay (ELISA) and western blot, respectively. Results: Western blot analysis using anti-His antibody confirmed the presence of a 15 kDa protein in the seeds of T1 transgenic lines. The amount of antigenic protein accumulated in the seeds of these transgenic lines was up to 0.05% of the total soluble protein (TSP). Conclusions: The canola oilseeds could provide a useful expression system to produce HCV core protein as a vaccine candidate. Hepatitis c virus (HCV) is the major cause of chronic liver disease. Currently, it is estimated that around 170 million cases in the world are persistently infected with this virus, which remains a serious public health concern (1). The treatment of hepatitis C is not effective in most cases, and is long and costly as well. Due to HCV genetic diversity and multiple mechanisms of persistence, there is still no approved vaccine for human use (2, 3). Therefore, it is desirable to develop an efficient and low-cost vaccine to prevent or immunize people against HCV infection. It is shown that resolving HCV infection is associated with strong, sustained, and specific T cell response against multiple viral epitopes (4). Among HCV proteins, HCV core protein (HCVcp) contains several well-characterized CD4 and CD8 encoded epitopes and is one of the most conserved HCV antigens as well (5). Applying core antigen in multi-component vaccines has been a successful strategy in animal and human clinical studies (6-8). Additionally, HCV core protein is employed in commercial HCV serological assays as a suitable capturing antigen to detect virus-specific antibodies and for diagnostic purposes (9). However, since the C-terminal hydrophobic region of HCVcp exerts immunosuppressive effects (2, 10), the N-terminal hydrophilic residue (HCVcp N-120), containing most of the conserved B and T cell epitopes, was employed for different diagnostic (9, 11) and vaccine applications (12-14). Therefore, to satisfy different diagnostic, research, and therapeutic demands, the production of HCVcp in various expression systems is addressed (2, 15, 16). Transgenic plants as environmentally friendly alternatives to conventional expression systems offer the possibility to produce an immunogen on an agricultural-scale with low production costs, lack of human pathogen and endotoxins (17, 18). Currently several plant-derived viral proteins such as hepatitis B surface antigen (19) and Norwalk virus capsid protein (20) are in clinical trial vaccine studies. Recently, establishing transgenic tobacco plants expressing HCVcp (21) or directing the expression of the first 143 amino acids from N-terminal in tobacco chloroplasts (22) are reported. However, in leafy crops such as tobacco, recombinant proteins are synthesized in an aqueous environment in which they are often unstable. In addition, other properties such as low protein content, high protease activity and the presence of phenolic compounds could negatively affect yield gains and storage stability of the harvested biomass (23). In this regard, plant seed is an attractive organ to produce and store recombinant protein. Indeed, the accumulation of recombinant proteins in seeds is reported at high levels in various studies (24, 25). As an example, the Escherichia coli heat-labile toxin B subunit (LT-B) accumulated to 2.4% of the total seed protein in soybean seed by glycinin seed promoter (26), which was much higher than those of tobacco up to 0.01% Total Soluble Protein (TSP) (27), and lettuce up to 0.05% TSP (28); using the LTB gene under the control of the CaMV 35S strong promoter. It is also shown that recombinant proteins in seeds remain stable and functional for years at ambient temperature (29, 30). During the last two decades, varieties of seed-based production platforms were developed in different plants, including cereals, legumes, and oilseeds (25). Canola (Brassica napus L.) seed has a great potential as a platform to produce and deliver antigenic proteins. In addition to the plant extensive and worldwide distribution, the seed offers high protein content, more than 20%, compared to 1% - 2% in leaf tissues (e g, tobacco) resulting in accumulation of recombinant proteins in a compact biomass (31). Moreover, canola oilseed was a source of separate entities of small (0.6 - 2 μm diameter) storage oil droplets termed oil-bodies. As an advantage, the oil-bodies in vaccine applications can serve as an attractive carrier to present and deliver foreign antigenic proteins (32). In the previous studies, the seed specific promoter fatty acid elongase 1 (FAE1) was isolated and efficiently applied to down regulate the erucic acid production in transgenic rapeseed by antisense construct of the FAE gene (33). Also, in a recent study, the expression controlled by the FAE seed-specific promoter was successful in producing the fusion espA, intimin and tir (EIT) antigen of enterohemorrhagic Escherichia coli (EHEC) in transgenic canola (31). To increase the expression level, in addition to using specific expression in high protein and low hydrolyzing enzyme organelle such as seed, two other strategies were applied; an increase of the transcript level by optimizing the synthetic sequence for plant host was conducted, and targeting the protein to the endoplasmic reticulum (ER) subcellular organelle by KDEL (Lys-Asp-Glu-Leu) retention signal was included. The current study aimed to investigate the possibility of producing truncated HCV core protein (N-121) in transgenic B. napus seeds by a seed-specific expression cassette based on the seed specific promoter FAE1. The coding sequence of the hydrophilic domain I of HCV core protein (1 - 121 amino acid) was taken from the pIVEX2.4a-core plasmid (34, 35). The plasmid was also used to express N-terminally 6xHis-tagged HCVcp protein in BL21-AI strain of E. coli by arabinose induction, as previously described (12). The HCVcp N-121 coding sequence was optimized to enhance the efficiency of gene expression in dicotyledonous plants according to our previous study (36). For this purpose, several modifications were considered including: I) Codon optimization according to codon usage table of B. napus; II) Removal of (plant) mRNA destabilizing sequences from native HCVcp coding sequence; III) The addition of Kozak (GCCACCATGGC) sequence (37) and hexahistidine (6 × His)-tag for nickel affinity purification at 5’ site; IV) The addition of nucleotides encoding Endoplasmic Reticulum Retrieval Signal KDEL at the 3’ end (38); V) The restriction sites for Cfr9I and SacI were designed at both ends of the gene for directional cloning into the same sites of plant expression binary vector pBI1400 (33). The plant-optimized HCVcp gene Tr-HCVcp was synthesized (ShineGene Molecular Biotech, Inc. Shanghai, China) and delivered as a clone in pUC57 plasmid. The synthetic fragment was released by Cfr9I/SacI and subcloned into the same sites of the plant binary vector pBI1400 under the control of FAE1 promoter as a seed-specific promoter (33) and the Nopaline Synthase transcriptional Terminator (NOS-Ter) (Figure 1). The ligation product was transformed into competent E. coli Top10 cells by heat shock method and grown on LB agar supplemented with 50 µg/mL kanamycin (39). Plasmids DNA from selected clones were purified and analyzed by restriction enzyme digestion with EcoRI. The recombinant plasmid was further confirmed by sequencing in both directions with F-FAE and R-core primers (Table 1). Primer synthesis and sequencing were performed by a commercial supplier (Gene Fanavaran Co., Iran). The recombinant plasmid pBI1400-core was transferred to Agrobacterium tumefaciens strain LBA4404 using the freeze and thaw standard methods (40). Transformants were screened by selection on luria-bertani (LB) agar plate containing kanamycin 50 mg/L and rifampicin 100 mg/L. The recombinant Agrobacterium colonies were verified by colony-polymerase chain reaction (PCR) using vector specific primers (Kozak FOR, NOS R) and gene specific primers (Kozak FOR, R-Core) (Table 1). Plant transformation and regeneration was carried out as described by Kahrizi et al. In brief, cotyledonary petiole explants were excised aseptically from four to five-day-old seedlings of B. napus (PF7045/91 cultivar). Following the infection and incubation of pre-cultured explants with the induced recombinant Agrobacterium, the explants were co-cultivated for two days in a dark place on co-cultivation medium at 22°C. The explants were then transferred to selection medium supplemented 8 μg/mL kanamycin for selective pressure and 200 μg/mL cefotaxime to eliminate Agrobacteria. Subculturing was done every 10 - 15 days and kanamycin concentration increased up to 15 mg/L. After the selection, rooted plants were transferred into soil and placed in a growth chamber for acclimatization, then transferred to the greenhouse where they matured, flowered and produced seeds. All cultures were incubated at 23 - 25°C under a 16/8 hours photoperiod (31, 41). The putative kanamycin resistant plants were analyzed by PCR method to confirm the integration of the transgene into the Brassica genome. The whole genomic DNA was extracted from the leaf tissue using the Plant Mini Kit (Qiagen, Germany). PCR was performed by gene specific primers (Kozak FOR, R-Core) at the concentration of 0.6 μM of each primer and carried out as follows: An initial denaturation step of 94°C for 5 minutes, followed by 30 cycles of amplification at 94°C for 30 seconds, 58°C for 30 seconds, and 72°C for 45 seconds and a final extension step of 72°C for 7 minutes. Mature Brassica seeds were ground into a fine powder in liquid nitrogen using mortar and pestle. Subsequently, 5 mL extraction buffer (50 mM Tris-HCl, pH 8, 500 mM sucrose, 200 mM NaCl, 0.1% Tween 20, 10 mM beta-mercaptoethanol, 1 mM phenylmethylsulfonyl fluoride (PMSF), and 5 mM ethylenediamine tetraacetic acid (EDTA)) was added to each gram of powdered seeds. The total soluble protein (TSP) was removed from cell debris by centrifugation of the seed extracts for 20 minutes at 4◦C (14000 rpm). Protein concentrations were determined by Bradford assay (42) using bovine serum albumin (BSA) as standard. For western blot analysis, non-transgenic and transgenic seed protein extracts were loaded to a 15% SDS-acrylamide gel and by the end of electrophoresis protein bands were transferred to the polyvinylidene difluoride (PVDF) membrane (Millipore). The membrane was blocked with 5% (w/v) skimed milk in PBS-Tween (1/1000v/v) and after three washing steps incubated with anti-5xHis antibody (Qiagen, Germany) 1:10000 in PBS-T for two hours at room temperature. Following washing steps, membrane was incubated with diluted (1:8000) horseradish peroxidase -conjugated goat anti-mouse antibody (Sigma, USA) for one hour. Finally, tetramethylbenzidine (TMB) was used to develop the color. The sandwich ELISA was performed using the streptavidin-biotin peroxidase complex (ABC) assay. Briefly, wells were coated overnight at room temperature with 100 µL of 5 µg/mL mouse monoclonal antibody against 21 - 40 aa of HCV core antigen (Abcam Co., UK) and blocked with 1% BSA for two hours at 37°C. After several washing steps, 50 μg of TSP from each plant extract was added to the coated wells in duplicates and incubated for one hour at 37°C. Following washing steps, biotinylated anti-core polyclonal antibodies (1:1000 dilution; Abcam Co., UK) were immersed into the wells and incubation continued at 37°C for one hour followed by washing steps and another similar incubation with streptavidin horseradish peroxidase (HRP) conjugate (1:4000; Sigma, USA). Finally, by adding TMB and color development, the absorbance was measured at 450 nm. To quantify the assay, a standard curve was prepared by applying serial dilution (in 0.1 - 1µg/ml range) of purified bacterial HCVcp to determine HCVcp expression level in seeds. The E. coli-derived HCVcp (eHCVcp) was purified through application of Nickel-Nitrilotriacetic Acid (Ni-NTA) chromatography as previously described (12, 35). Graph Pad Prism, ver. 5.0 (Graph Pad Software, USA) was used to analyze data. Statistical analysis was carried out using ANOVA test. Statistical significance was set at P ≤ 0.05. To improve codon-utilization of the 363 bp sequence encoding 121 aa of the first domain of HCV core protein in plants, the nucleotide changes were done according to the codon frequency usage table for B. napus. The gene optimization strategy increased the codon adaptation index (CAI) value from 0.7 to 0.87 for B. napus host and reduced GC rate from 62.62% to 51.05%. In addition, the possible deleterious motif of “GGTAAG” splice site in nucleotides 358 - 363 of native HCVcp was removed. To improve the expression level, insertion of the Kozak (GCCACCATGGC) sequence (37) at translation start site (ATG) was also considered. The Kozak sequence for plant hosts contains three essential nucleotides at positions -3 (A), +4 (G) and +5 (C) from ATG. Therefore, to include these two nucleotides, which were not present in the current study gene sequence, the GCT codon sequence that encodes alanine amino acid was added to the downstream of ATG codon. Other elements (His-tag, KDEL, and restriction sites) also included the HCVcp basal sequence in Tr-HCVcp. The results of DNA sequencing (not shown) indicated the Kozak sequence (GCCACCATGGC) harboring, the start codon (ATG) and 6 × His-tag at 5’ of the gene, KDEL nucleotides at 3’ end, designed restriction sites, and all nucleotide modifications properly located in the Tr-HCVcp sequence. The optimized fragment was subcloned into the plant binary vector pBI1400 under the control of the seed-specific FAE promoter and NOS-Ter transcriptional terminator (Figure 1). To construct the plant expression vector, a 418 bp fragment corresponding to the synthetic gene was isolated from plasmid pUC57-core after Cfr9I and SacI restrictive digestion. The fragment was inserted into pBI1400 vector digested by the same restriction endonuclease instead of 1889 bp gus gene fragment (Figure 2). A, Preparation of digested vector and HCVcp. lanes 1 and 2: pUC57-core and pBI1400 digested with Cfr9I/SacI respectively; B, Screening the recombinant pBI1400-core by restriction analysis with EcoRI. Lanes 1 - 5: potential clones were expected to release an 1152 bp fragment; lane 6: pBI1400 plasmid released a 2653 bp fragment (non-recombinant vector). M1: 100 bp; M2: 10 kb marker. Digestion with EcoRI restriction enzyme confirmed the recombinant plasmids (pBI1400-core) (Figure 1 and 2 B). Sequencing results (not shown) in both directions with vector specific primer (F-FAE) and gene specific primer (R-Core) further confirmed the presence of cloned Tr-HCVcp gene in the expression vector with no alterations in the nucleotides. The verified construct was transferred into A. tumefaciens strain LBA4404. colony-PCR assay indicated the expected 428 bp fragment using gene specific primers (Kozak FOR, R-Core) and the 677 bp fragment using vector specific primers (Kozak FOR, NOS R) (Figure 3). The recombinant Agrobacterium was used in plant transformation experiments. A, Schematic diagram indicates binding sites of the primers used for colony PCR; B, colony PCR to check transformed Agrobacteria. Lane 1: colony PCR using Kozak FOR and NOS R primers; lane 2: colony PCR using Kozak FOR and R-Core primers; lane M: 100 bp DNA ladder; lane C-: untransformed-Agrobacterium (without construct) as negative control. Lane C+: construct as positive control. After a few days, the cotyledonary leaves inoculated with Agrobacterium regenerated a new ex-plant at the cutting edges (Figure 4 A). The putative transgenic plants were initially selected by kanamycin. The presence of the HCV core gene in the isolated genomic DNA from putative transgenic (T0) lines was proofed by PCR using specific primers. PCR amplification produced a fragment of the expected size 428 bp in the transgenic plants, while the untransformed control plants did not show any amplification (Figure 4 B). Individual plantlets, positive for desired PCR product, were fully regenerated. The 17 unrelated transformed lines were acclimatized, and transferred to the greenhouse; however, the rest of the transgenic lines, except five, neither set flowers, nor produced seeds. A, Regeneration and selection of putative transgenic plants; B, Analysis of the transgenic plants by PCR; lanes 1 - 8: PCR on genomic DNA of different putative transgenic plants; C+: positive control (pBI1400-core plasmid); C-: negative control (no transgenic plant); M: 100 bp DNA ladder. 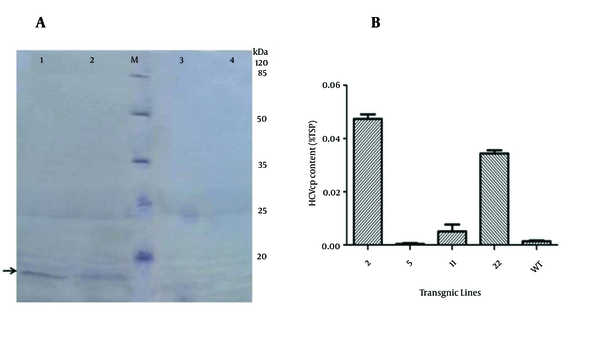 To detect and analyze plant-derived HCVcp (pHCVcp), the seed extracts were evaluated by western blot assays (Figure 5 A). Results of western blot analysis indicated that the plants expressed a protein of approximately 15 kDa, while wild-type total seed protein as negative control lacked the core protein. A, Western blot using an anti-His antibody; lanes 1, 2, 3: transgenic lines no. 2, 22, and 11, respectively; lane M: prestained protein ladder; lane 4: non transgenic plant; B, Quantitative analysis of HCVcp in transgenic Brassica seeds using sandwich ELISA. The amount of HCV core protein in TSP was calculated using purified HCVcp as a standard. Each bar represents an average of three repetition ± standard error. The expression of the plant-derived HCVcp was assessed by the ability to bind to mono and polyclonal anti-core antibodies in the sandwich ELISA. The ELISA was designed and set up to detect HCVcp in plant extract specifically, and apply monoclonal anti-core antibody in the first step excluding non-specific reaction. Values obtained in this assay were used to determine the percentage of total soluble protein (%TSP) in the sample using a standard curve prepared from the purified E. coli drived HCVcp. ELISA results indicated that transgenic line 2, having the highest HCVcp contents and the expression levels in mature seeds of T1 plants, reached up to 0.05% TSP equivalent to 10 µg per gram seed soluble proteins (Figure 5 B). The successful expression of HCV core protein in transgenic and transplastomic tobacco leaf was previously reported (21, 22). However, to the authors’ best knowledge, there was no prior report available on employing other plant expression systems or hosts to express HCV core protein. Canola oilseed is a promising expression platform with unique advantages such as long preservation of active recombinant protein and being consumable as food (31, 43). Therefore, the plant based system was found applicable and ideal to investigate the expression of HCV vaccine candidate protein. The current study described the successful transgenic seed-based expression of truncated HCV core protein in B. napus. To overcome low expression level in transgenic plant, the three strategies of seed specific expression, codon optimization, and accumulation in endoplasmic reticulum (ER) were combined. 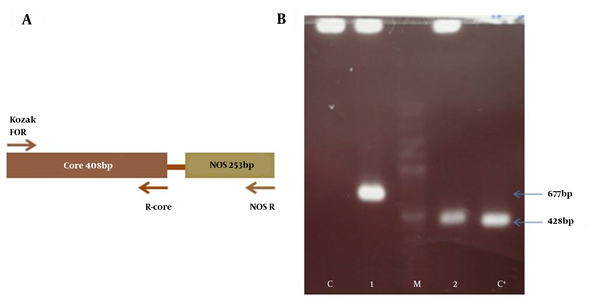 The study used a seed specific promoter and constructed a seed expression cassette containing FAE promoter, Kozak sequence for better and accurate start codon recognition, plant based optimized HCVcp sequence, KDEL retention signal, an effective transcription termination signal and nptII (neomycin phosphotransferase) gene in T-DNA used to perform Agrobacterium-mediated transformation of Brassica plants. The regulatory seed specific FAE promoter of B. napus, as previous studies indicated, can be used to express enough amount of antigen needed for immunization (31). In a study by Amani et al. (2011), the expression level of the fusion EIT antigen of EHEC varied from 0.2% TSP to 0.33% TSP in transgenic canola under the control of seed specific FAE promoter (31). This content could be compared to that of the present study in which HCV core protein expressed under the FAE promoter control accumulated up to 0.05% of TSP in transgenic canola seed. However, since the expression level was under the influence of the random nature of Agrobacterium mediated gene insertion (44); it is important to analyze a large number of transformed plants to select the best transgenic lines. However, in the current experience most transgenic lines failed to set seeds and showed abnormal phenotypes including vegetative growth retardation, arrangement of leaves in rosettes, and slow blooming. These malformations were reported in the study by Cheon et al. indicating that overexpression of human erythropoietin gene causes pleiotropic effects in all T0 plants (45). The used cauliflower mosaic virus (CaMV) 35S promoter, but the current study used seed specific promoter (FAE1) and expression to overcome the potential negative effect of recombinant protein on vegetative plant growth. Therefore, the failure in seed production might have a non-specific reason rather than the mentioned one. However, random integration in the genome by causing insertional mutations or influencing the site of integration could be potentially deleterious to the plant host. Nevertheless, increasing the level of expression could be done later by crossing the high recombinant protein producer plants and selecting the offspring which produce the highest expression (46). The gene optimization of HCVcp DNA sequence to achieve better expression efficiency in plant was another important strategy which was considered. Recently the researchers showed that the plant codon optimized coat protein LI gene of bovine papillomavirus type 1 (BPV-1) increased expression significantly in Nicotiana benthamiana in comparison with its unmodified counterpart (47). In this respect, codon usage converted to the corresponding plant preferences increased the codon adaptation index (CAI) value from 0.7 to 0.87, which was in favor of codon-utilization for B. napus (48). Optimization of the transcription was further achieved by removing the putative deleterious splicing motif in plants GGTAAG, which results in destabilizing of the gene transcripts. To ameliorate the expression level, insertion of the Kozak sequence (GCCACCATGGC) (37) at translation start site (ATG) was also considered (37). In plants Kozak sequence, the preference for guanine at position +4 was 85% and for cytosine at +5 was 77%, which were considerably high (49); therefore, to provide these two nucleotides in the two positions, alanine amino acid (encoded by codon GCT) was added following the initial methionine (50). Moreover, to improve the stability and expression of pHCVcp, the endoplasmic reticulum retrieval motif KDEL (Lys-Asp-Glu-Leu) was also considered at 3’ site of Tr-HCVcp sequence. This strategy was investigated in several studies to express transgenes. For example; in a recent study, GA733-FcK transgenic plants expressing the tumor-associated antigen GA733 fused to the immunoglobulin Fc fragment and the ER retention sequence (GA733-FcK) had stronger protein expression than GA733-Fc transgenic plants in the absence of this sequence, which had no detectable protein expression. These results indicated that localization of GA733-Fc in ER stabilized and enhanced its expression (51). The ELISA results in the current study showed some variation in the level of protein expression. Importantly, recognition of the plant-derived HCVcp by mono and polyclonal antibodies in the sandwich ELISA suggested that the plant-derived HCVcp adopted its antigenicity. The monoclonal antibody used in the assay was against amino acids 21 - 40 on HCV core antigen. This region carries two important immunological epitopes (52): those with 23 - 44 aa are highly promiscuous; CD4 + T cell epitopes and the 35 - 44 aa are HCV specific HLA-A2 restricted CTL epitope. They were effective immunogens in vaccine phase II clinical trials in multi-epitope complexes (53). Therefore, plant produced pHCVcp has the promising structure of vaccine candidate. In conclusion, authors believe that transgenic Brassica oilseed is an effective tool to produce HCV core protein for immunization study. The immunogenicity of the transgenic seed- derived HCV core protein in animal model is in progress. Authors wish to thank Dr. Alireza Khabiri, from Pasteur Institute of Iran, for designing and preparing ELISA kit to detect HCV core protein. Authors also wish to thank Dr. Shiva Hamze and Dr. Ruhollah Kazemi for technical help and the staff of the National Institute of Genetic Engineering and Biotechnology for their support. Authors’ Contribution: All the authors were involved in all the steps of manuscript preparation. Funding/Support: This work was supported by Pasteur Institute of Iran.